They Shoot Turkeys, Don’t They? Yes, they do. Just ask Lucretia “Mother” Hannong, who shot them from her back porch in West Palm Beach. I think Mother Hannong is a forgotten figure in the history of Palm Beach County; she didn’t do anything famous, except reach the incredible age of 110. She might very well be the oldest person ever to have lived in Palm Beach County; she certainly held that title when she was alive. 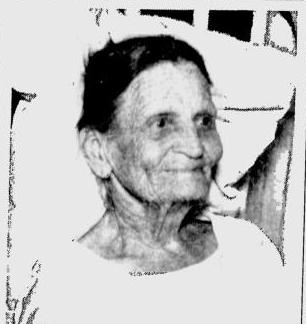 I found Mother Hannong purely by accident; I was gazing through old Palm Beach Post newspapers online looking for old grocery ads when the headline “County’s Oldest Living Mother Finds Time Passes Fast as she Celebrates Birthday” caught my eye. She was born Mary Lucretia Spires in 1840, and in 1870 she married Henry Hannong in South Carolina. Henry was from Germany, probably from along the French-German border. He first arrived in New York with his parents, then made his way to South Carolina. Lucretia and Henry had six children, and tried farming in many states. They made their way towards Florida in 1885, with stops at towns in North Florida. Then in 1893, they chartered the boat Sultana and sailed into the old Palm Beach Inlet on Singer Island, about 1/2 mile north of today’s Palm Beach Inlet. jumped in your boat. When the reporter asked about her most thrilling memory, she recalled the first visit of the Seminole Indians, when she awoke one morning to see 60 Seminoles camped in her front yard; they came about twice a year to trade with the local residents, and often a lone Seminole would ride in and leave a side of venison for the Hannongs. Henry Hannong was the caretaker for the Courthouse, and served in that role until his death in 1926. After I read the article, a few days later I wondered how long Mother Hannong ended up living. I searched the archive again…other article titles were “Mother Hannong celebrates 104th birthday” ; “Mother Hannong has 107th birthday today”, and then finally, “Grandma Hannong is 110 years old today.” She was still quite sharp, and offered the following “I’ve been a’thinkin lately that I’m not going to get much older than 110; I’m just like a clock – there’s nothing really wrong with me, but I’m just getting run down, going slower and slower…”. She also wondered..”if they’ll hoist the flag at the courthouse for me when I go as they did for my dear old husband when he passed on.” On May 16, 1951, she passed away quietly after a long hospital stay…I don’t know if the flag was flown for her as she wished. Imagine all she saw – the Civil War, the Spanish-American War, World War I, World War II, the Korean War, electricity, the telephone, the automobile, the airplane, television…all in one lifetime. Her death was covered in all the major newspapers around the world, including the New York Times. The Hannong decendents still live in Palm Beach County, and it happens to be that I work with one of them. When I originally spotted the article, I noticed the last name and wondered if it was the same family. So I emailed my colleague, Phillip Hannong, and indeed, he is the great-great-great grandson of Lucretia Hannong. He was born well after she had passed away, and wishes the family had more photographs of those pioneer days. Mother Hannong’s story has made me realize that the Internet and today’s text-based newspaper systems have a very serious flaw – you only find what you are looking for. I wasn’t looking for Mother Hannong – I found her only because she was on the same newspaper page as what I was looking for. I really believe that the best way to know a time, to really study a time, is through old newspapers. That is something we will soon lose as web-based media replaces the traditional printed page. 5 Responses to They Shoot Turkeys, Don’t They? What a great story! It’s so nice to hear what you’re finding in the Palm Beach Post historic archive (which, by the way, any other readers can search for free here: http://www2.palmbeachpost.com/archives/ ; check out the search tips link on that page for more info on advanced searching and browsing the old papers). The Historic Archives are like a treasure-trove with new secrets revealed with every search. They are so much fun to look through – like peering into the past. What a great article Ginger.